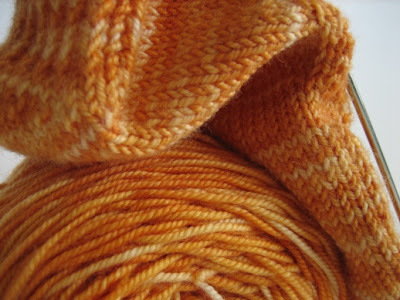 We Heart Yarn: We have a heel! Third time's a charm. Maybe. 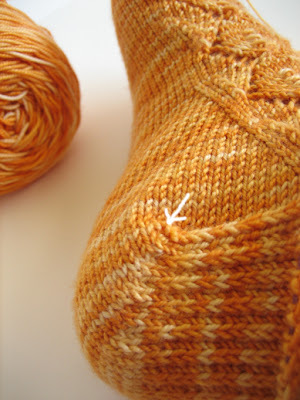 Question: The arrow indicates the border between the "turn" and the beginning of the Slip one-knit one heel flap. The burning question is, do you think this looks like it fits. It feels good. It looks about right. I think I would like the Sl-1 K-1 to continue into the "turn". Just wondering what y'all think? Helllooooo Allison! I've been wondering how you've been doing! So good to hear from you! I'm so glad you finished up the scarf, I'm sure it looks beautiful!! I caught this broadcast on NPR yesterday. It was about an art shanty village on Medicine Lake in Minnesota. Literally, ON the frozen lake. It has its roots in the ice fishing tradition. It started with one, but has grown to about 20 shanties now, including a knitting shanty...and a mail shanty, and a science shanty...even a shanty of misfit toys...too cool. 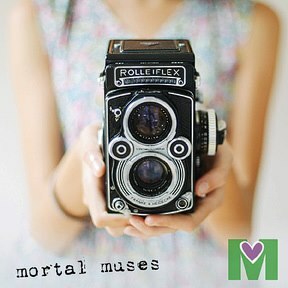 I would love to go to this! Rani, have you ever been?? Cockeyed, Hot Flash and Etta Mae...check out this sock monkey!!! It won the grand prize in a Food Network cake challenge!!! Yum! I tend to wear out socks just under the heel, near the turn. I do the Sl,Kl on both the build up and the decrease sections when I make shortrow heels because it gives me an extra layer under the heel as well as on the back. 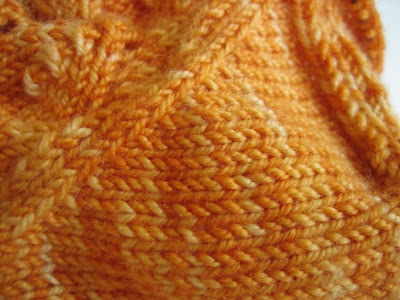 I also alternate the rows of K1 S1 so that it makes an eye of partridge heel. Anything to make it thicker anywhere on the heel. It definitely looks like it fits. I think continuing the slip stitches through the turn might be a good way to increase the durability... I'd be mildly concerned that you'd be able to feel the ridge under your heel where it changes from stockinette to sl st, but I bet it would be pretty subtle. I prefer that the k1 sl1 be on the back of the heel and not continued into the turn -- but that's just me. I don't have enough experience to give you any advice other than to say you'll know what's best. This is the first time I've ever heard of the Ice Shanty Art and I only live a few miles away! I can't believe I missed it. I'll be there next year and I'll post pics of the knitting shack, if it's still there! !